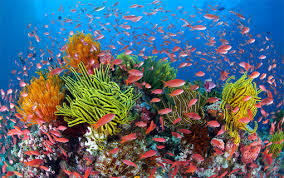 Description: This unit explores the natural wonder and beauty of the coral reef fringing Queensland's northern coast. The delicacy of the ecosystem is threatened by ecotourism, mining and shipping yet there is no effective Government policy to protect the reef. Instead social and economic interests dominate, combining to destroy this enviroment.The main threats to the Reef are storm damage, crown-of-thorns, bleaching, land runoff, mining, shipping and military games.